You have a wide range of options to sort through when it comes to selecting the right artificial grass for your lawn. Options can range from aesthetic choices such as the length of the blades of grass on the lawn to more practical concerns such as the number of layers or if the lawn uses infill. 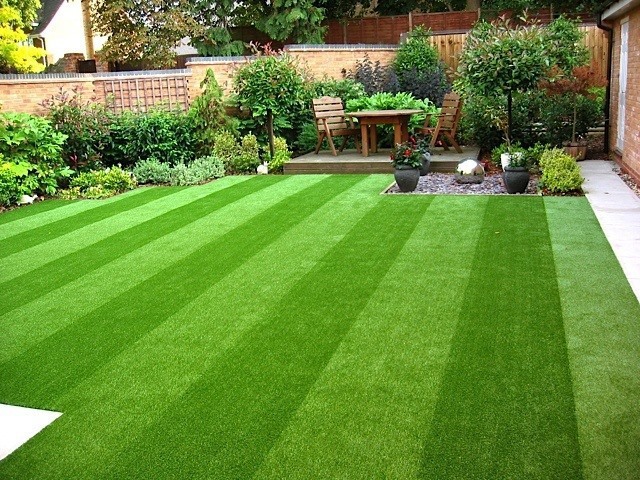 One of the benefits of installing fake grass is that you have a lot of control over how your lawn will look. One of the most important decisions you will make when selecting your synthetic grass is determining the color of your lawn. Natural grass is green, but the shade of the grass can differ greatly depending on its type. For example, Bermuda grass tends to be a dark green shade, while St. Augustine grass is typically much lighter. Just like with natural grass types, you can select an artificial turf lawn that has a specific shade. Color tints run from light green to dark green and can be matched to mimic specific types of natural grass. It’s even possible to get artificial turf that has brown at the bottom so that it looks like the layer of dead grass and dirt at the bottom of most natural grass lawns. You can get a sense for what the shade of grass will look like by requesting a sample. When you receive your full order, compare it to the sample to make sure that the shades match. Before you select your artificial turf, it might be a good idea to take a tour around your neighborhood and see the types of grasses that are installed in your neighbor’s lawns. Having an artificial grass lawn that closely resembles the types of natural grass lawns that surround your home can make it feel more natural and less obtrusive. The color tint of your lawn impacts more than just its look; it can also play a role in how hot your lawn gets over the summer. Artificial turf that is a darker shade will absorbs and retains more sunlight than synthetic turf that is a lighter shade. This means that darker turfs will be warmer to the touch. You’ll want to keep this in mind — particularly if you live in warm weather environments or will be installing your lawn in a place that will have little shade. In these situations, a lighter shade of artificial turf is likely your best bet.